Hi, my name is Philip McMaster, a SOCIAL ARTIST from Canada with many hats - aka "SustainaClaus", "Blockchain Bethune" "Professor Planet" and the "Adventurepreneur" ... as well as "DaLong" ("Big Dragon") in China, where I have lived and traveled for over a decade. I'm here on Patreon to see if my new friends (and hopefully old friends) will join with me to build up the ConscienceLAND Project and "Pass the Torch" of the MOST IMPORTANT PROJECT IN THE WORLD to the next generation. It's all about BALANCE, sharing L.O.V.E. (Lifestyle Of Voluntary Effort) and living a positive, vibrant and meaningful Lifestyle Of Health, Happiness And Sustainability (LOHHAS) from a grounded, safe and balanced State Of Mind. I know many people will also join me as the "SustainaClaus" in their community, supporting and encouraging local children and their parents, and using Change Wednesdays, and Fridays For Future leading the way for the naughty to become nice and supporting the kids fighting for their futures. As long as you're subscribed as a Citizen, I hope to REDUCE YOUR ANXIETY AND STRESS by including you in online and offline discussions about ISR (Individual Social Responsibility), and by exploring methods of preparing the citizens of ConscienceLAND - young and old - to understand, prepare and competently deal with the inevitable disruptions to their lives resulting from the growing Societal, Environmental and Economic chaos. In my lifetime of traveling the globe, teaching, researching, building, presenting and networking, I believe I've learned some of the most important things needed for our common survival and feel the URGENT NEED to share with you how to make our world a better place. To do this we have to remain alive and functional. We need to use emerging systems and technologies to augment our intelligence, prove our Value to Society, move back to trading within communities, reduce our impact and for those systems to enhance our health and happiness. THE MOST PRESSING thing the world needs is not a new technology, it's a NEW STORY (Narrative) that "fits" with humanity's Global Goals. 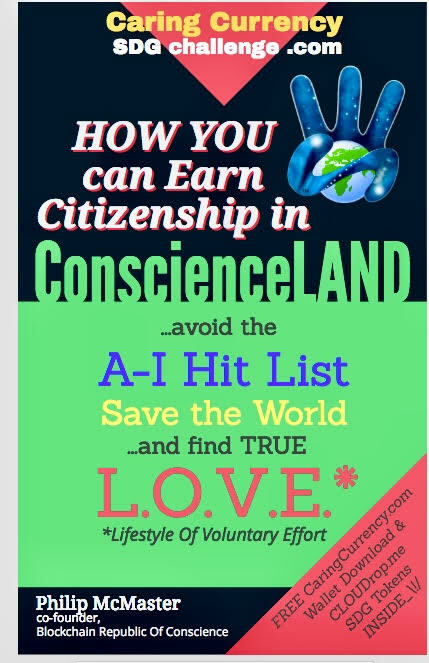 The Republic Of Conscience / ConscienceLAND is full of new methods, technologies, memes, concepts and stories that are relevant, engaging, accurate and authentic to the cause. I WELCOME YOUR PARTICIPATION AND SUPPORT to co-create easy-to-read books, guides, detailed manuals, interesting videos, exciting programs, workshops and meetups, authentic products, meaningful lectures and presentations, pop-up embassies, fun events and artistic representations to create and achieve a "Sustainable World Order" in the next 10 years!!! - Your name on the ConscienceLAND "Good List"
- Eligible for Caring Currency "Air Drop"